The sweet potato wedges take place of chips, as this type of potato contains a lot more nutrients, including high amounts of beta carotine and vitamin A. 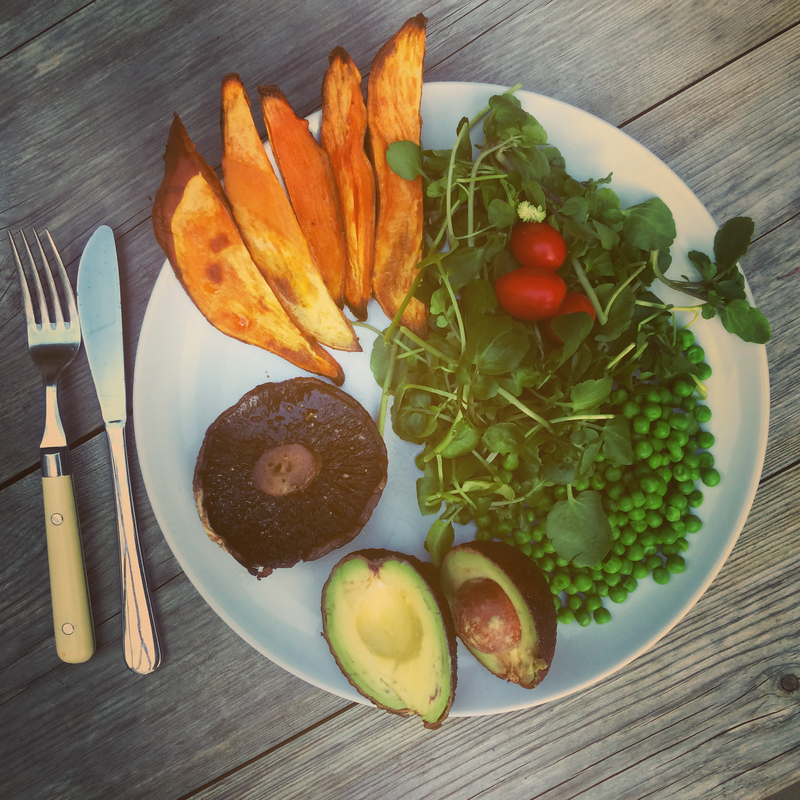 Beta carotine is more readily absorbed when we eat some healthy fats with them too – which is why fresh avocado takes the place of any mayonnaise you might have on the side of your steak & chips. Avocado is also one of those foods that gives us a whole heap of health benefits; they’re high in vitamin K (essential to maintaining bone and tissue health), contain even more potassium than bananas, is loaded with heart-healthy monosaturated fatty acids, which is very helpful in reducing inflammation, and actually shows anti-cancerous effects. They’re also full of fibre, so will ‘keep you regular’ if you know what I mean…. The Portobello mushroom is the ‘meat’ to this dish. These large mushrooms can be grilled, and actually give a very juicy, ‘meaty’ texture. These large mushrooms are allowed to grow for longer than their closed-cup smaller relatives (yes, smaller mushrooms are just the ones that are harvested earlier in most cases)…. These Portobello mushrooms are allowed to grow up to about 4 inches in diameter, making them perfect for replacing something like steak or a burger in a vegan meal. Mushrooms are also pretty high in fibre, potassium and have a good balance or protein and carbohydrates, without the huge amount of slow-to-digest calories steak might offer…. While a pub plate might throw on some ‘garnish’ to constitute a salad, this meal includes iron-rich fresh watercress and spinach, tomatoes and peas for a well-rounded and substantial salad. Cut the sweet potato into wedge-like strips or chunks; cutting them fairly evenly will help them to cook evenly, and if you cut them quite thin, they’ll cook even quicker. Place the wedges in a single layer on a baking sheet; if your coconut oil is liquid, then drizzle over 1 ½ tsp over the potato. If it is solid, take a heaped tsp and dab pieces of the oil over the wedges. Turn the oven to 220 degrees C and when its to temperature, pop the wedges in and cook for approximately 15-12 minutes depending upon your oven type. Keep checking to make sure they don’t burn! Cut each avocado in half; if you’re using small avocados then give each person a whole one, if large then place half on each plate. You can drizzle with an olive oil and balsamic vinegar salad dressing if you like. Cook your peas and pour an equal amount onto each plate. Add your handfuls of watercress and spinach, and drop on the cherry tomatoes. Simple to prepare and satisfying too – serve this at a Summer get-together for vegans, veggies and meat-eaters alike!